I was planning to make tacos, but we received a package from Food For Life (the company that makes Ezekiel brand bread) containing samples of their new black rice gluten-free tortillas, so we made a last minute change. I went ahead with the planned Ancho Lentil Taco filling recipe from the PPK site and Isa Does It. We love this recipe – it’s easy, delicious, and versatile; we use it in tacos, on nachos, and now, in quesadillas. I was low on ancho chili powder, so I had to use a little bit of regular chili powder to fill it out, but it wasn’t noticeable. I also only made a half batch of lentils since the full recipe makes a ton. 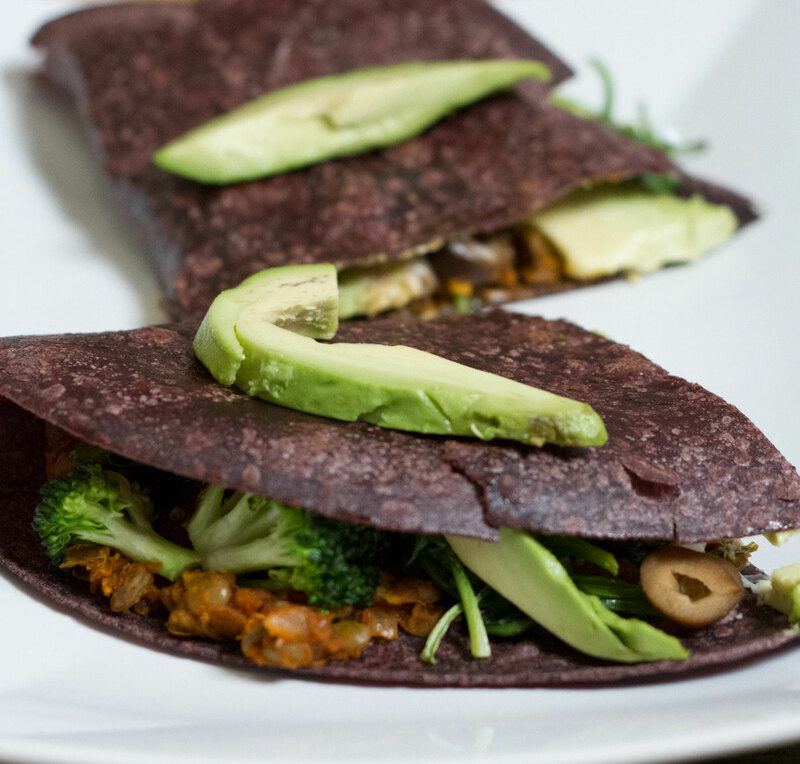 We like our quesadillas pretty loaded, so in addition to the lentils, we also filled them with sautéed broccoli & spinach, sliced avocado, black olives, salsa and Daiya Jack-style cheese. Quesadilla night is always build-your-own style here, so we both get to have them just the way we want them. Mine always have more cheese than Seth’s and his have more avocado and salsa than mine. A nice salad would be good with this too, but we had plenty of veggies in the quesadillas, so we skipped it this time. We were also really excited to try out the new tortillas. There will be a full review of the product coming soon, once I try them out in a few more recipes, but I will say this: we really like them, and once we run out, we’ll be buying more.